Discretionary Investment Management is a form of professional investment management that invests on behalf of their clients through a variety of securities. Compliant securities list are lists of securities you can distribute as you can filter them with attributes such as authorized country of distribution, tax incentives, legal aspects, socially responsible labels, risk levels and more. In countries like France or the United Kingdom, those lists are called Buy lists and they are enriched from a custodian or bank source. In France a list of “produits autorisés” from the insurance company is shared with wealth and asset managers. You can prepare those lists from an excel spreadsheet simply using the first column to specify authorized ISIN. 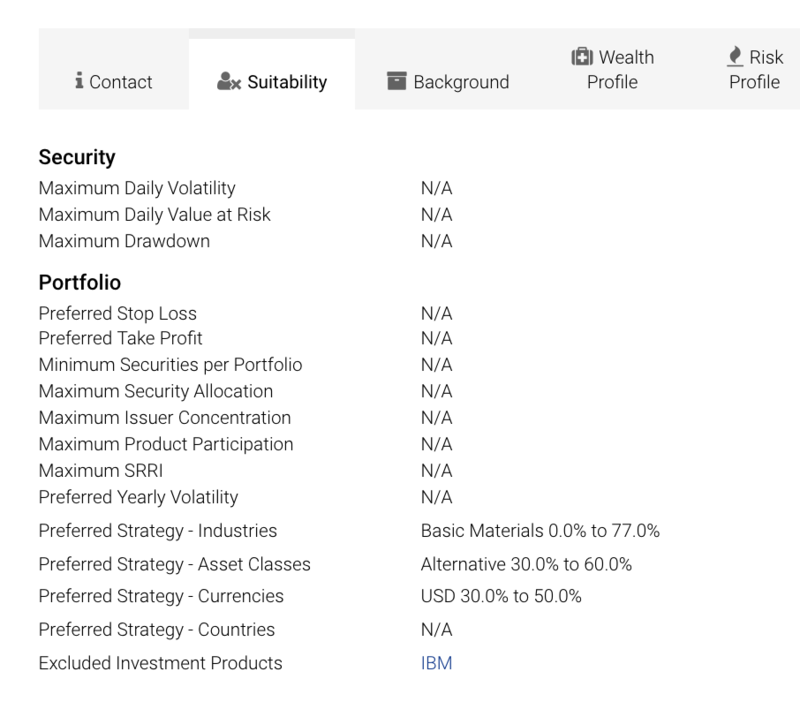 If your clients have "Excluded Investment Products" in their CRM like you can see below with IBM, you will find a "Not Compliant" notification in the trade blotter you will generate at a later stage. However, we suggest you to setup this account out from a DFM process to prevent suitability errors. If a client can not follow a compliant list, we suggest you to setup the portfolio with a strategy and an advisory approach instead. In the left menu spot the Compliance Lists tab. Compliance Lists is represented with a hammer. 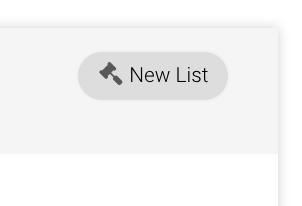 Click on the hammer and then click on New List. Choose a name and write a description then click on Save. You can add securities one by one or load a list of ISIN. 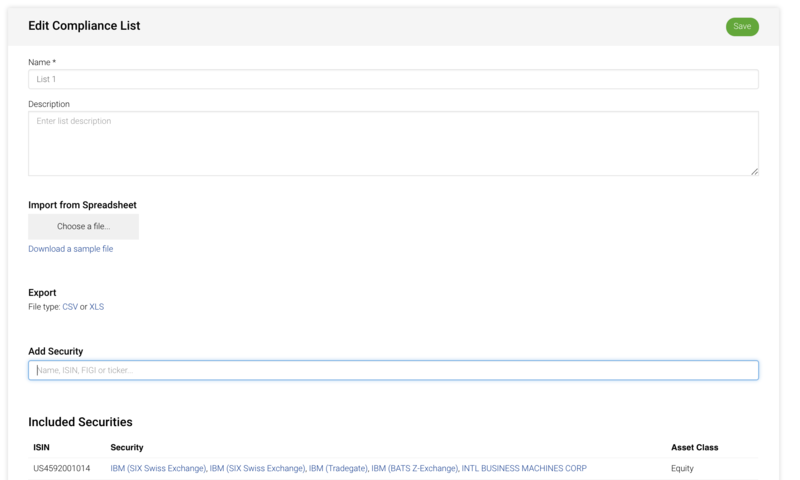 Please note that if you wish to add Custom Securities, you should add them manually. You can create new Model Portfolios and find existing ones under the My Account /Company/Model Portfolios. In the left menu spot the Model Portfolios. Select reference currency then and here you can set the Daily Price Change. If you subscribe to price feeds then you and your colleagues will receivex price notification if price drops by more than X%. A link to edit, clone, export or remove Model Portfolios is also available from this page. 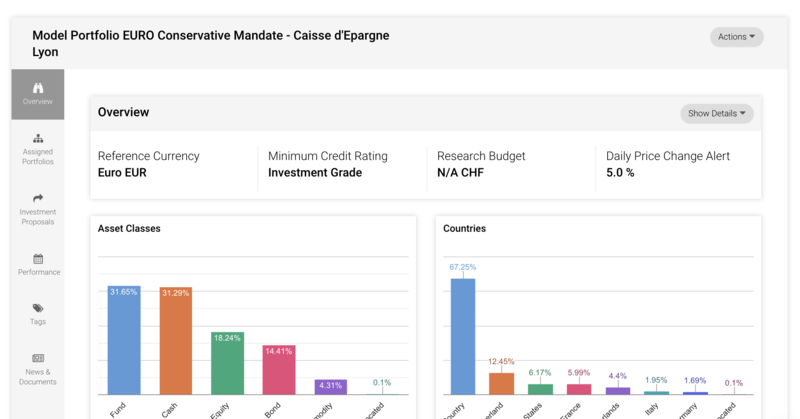 From the edit page you can modify the Model's description and other related information, as well as specify underlying securities allocation. 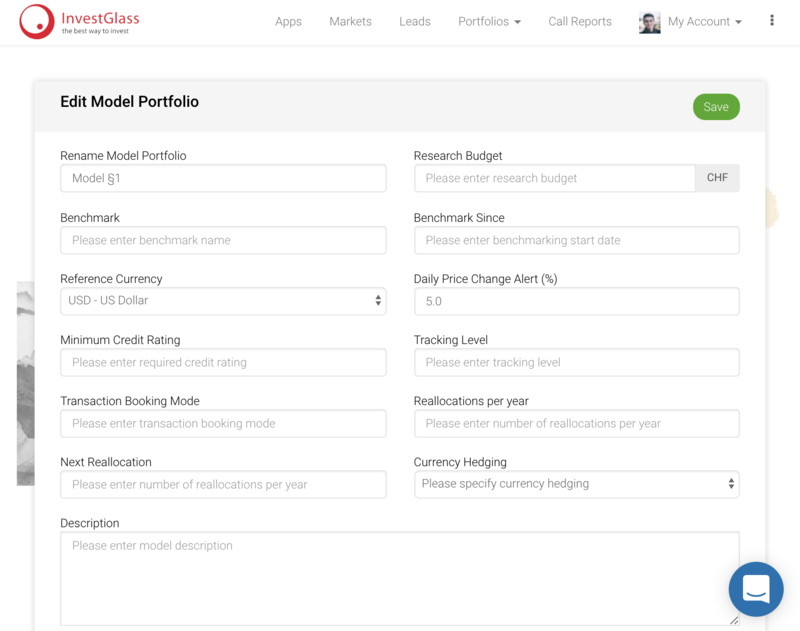 Each time securities allocation is modified, InvestGlass will generate a new Model Version. Versioning allows to keep track of the model changes over time. All versions are accessible from the Model Portfolio page. 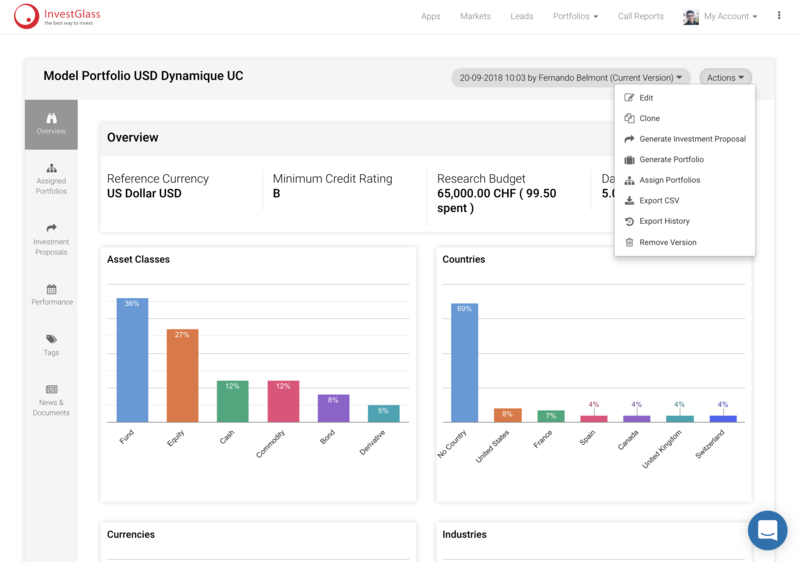 You have an option to export Model Portfolio History with the Export History button of the Actions menu in the Model Portfolio page. 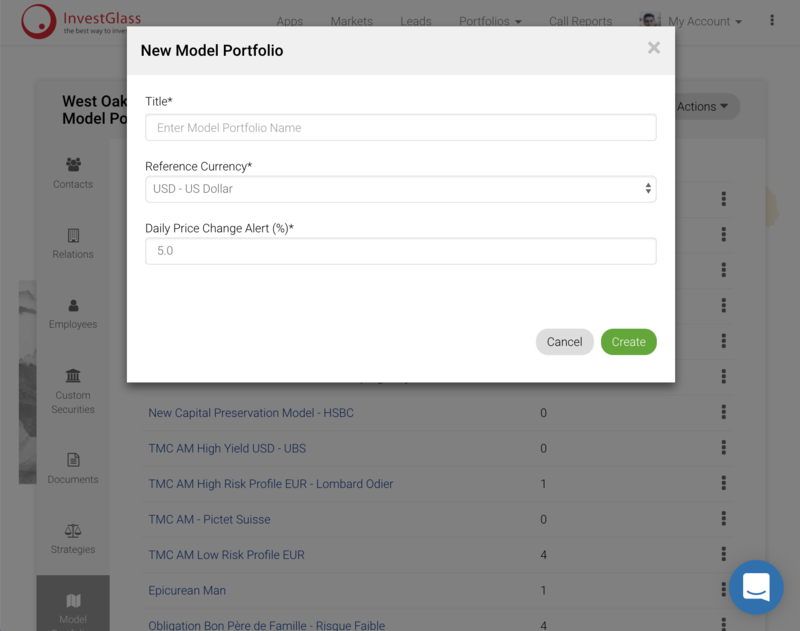 Only the latest version will be used to ensure actual portfolios are properly following the target Model Portfolio. 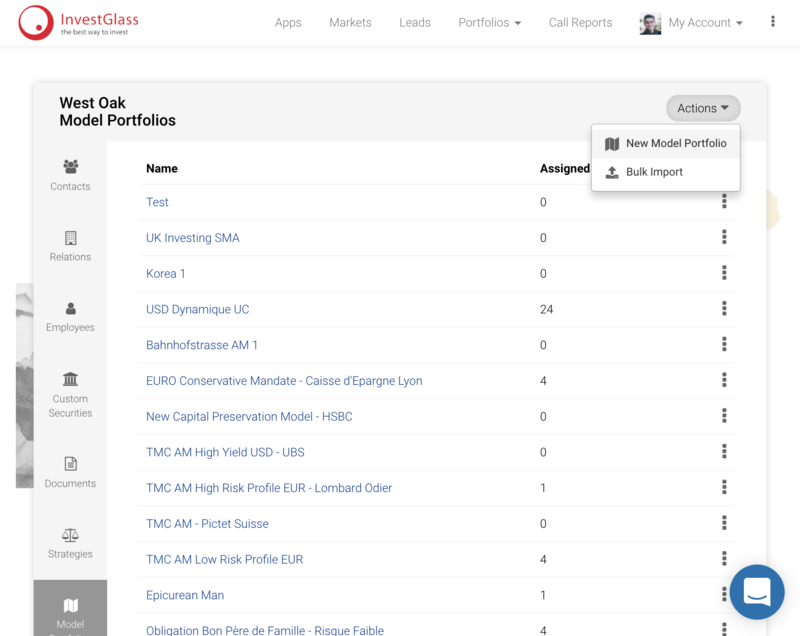 To assign a portfolio to a model, go to your model and in Actions button on the top right, select Assign Portfolios. 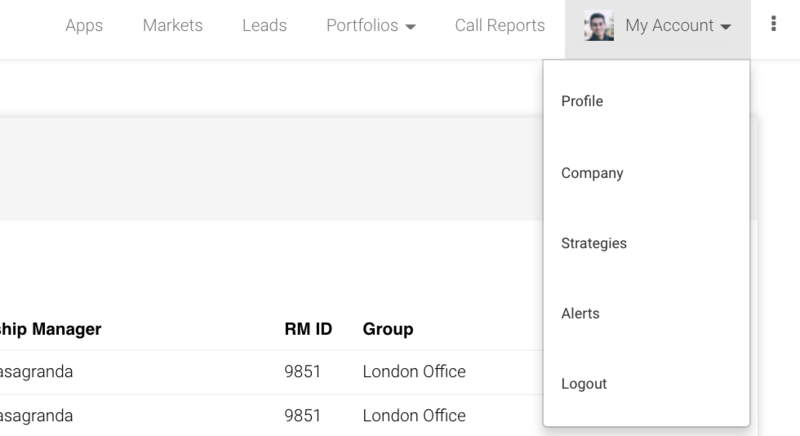 Select contact and portfolio then click on Select Portfolio. Please note that you can as many portfolio as needed then assign them here click clicking on Assign. We are going to change portfolio weights. Go back to your My Account Company Page and Model Portfolio menu. Place your mouse on the model line and click on the tree dash to open the option menu. Here you can click on Edit. You can also click on the model name, and in the Actions button click on Edit. Then on the left you will find an Import Model Portfolio Securities button where you can upload a whole new allocation weights. You can also change weights manually. Simply check the table on the bottom of the Edit Model Portfolio. 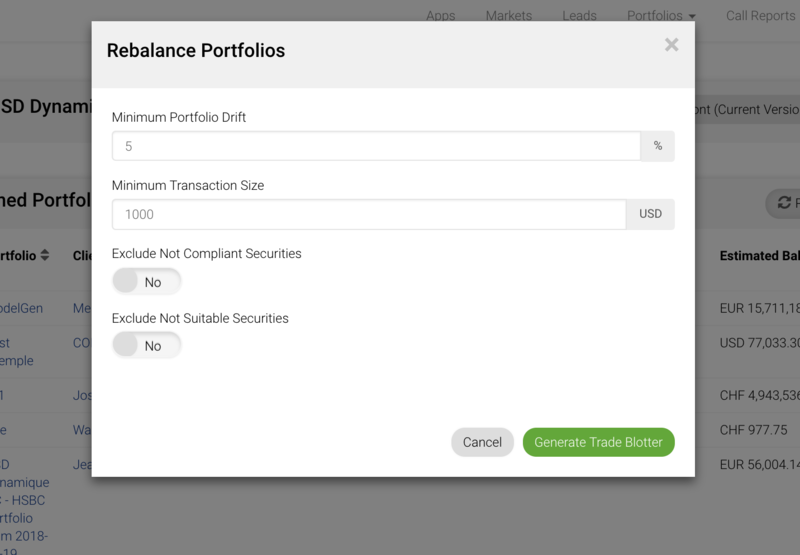 There you can change allocation weights and add securities. 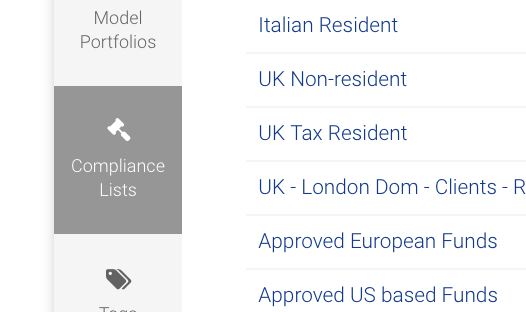 An option will help you to select only securities included in a specific Compliance list. Simply select from the drop down menu the relevant list. Click on SAVE to update the model portfolio. Once saved you will be directed to the view page of the Model Portfolio. 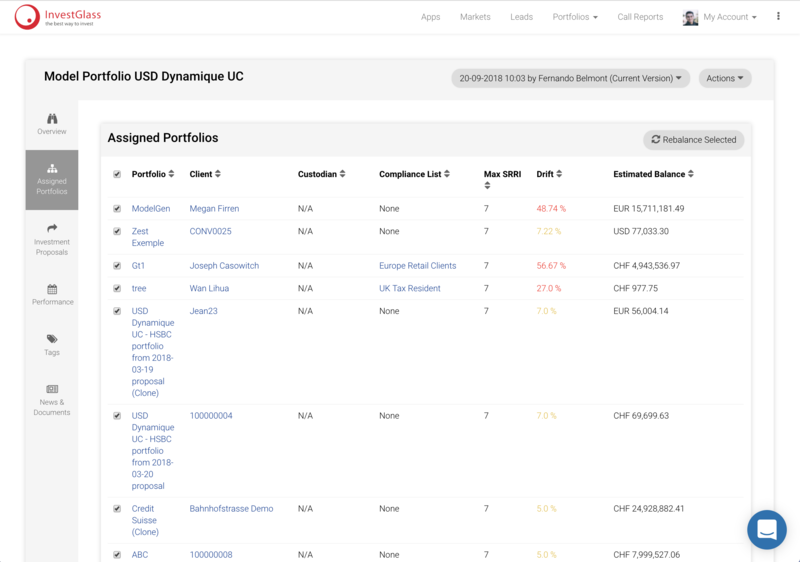 From the left menu click on Assigned Portfolios to rebalance portfolio. 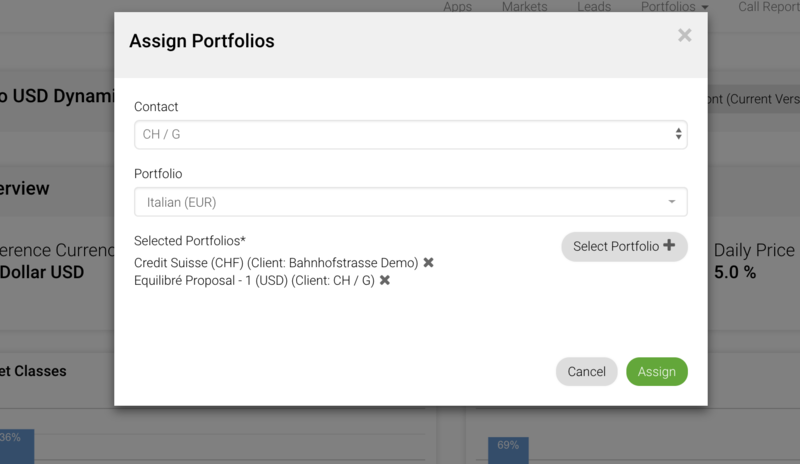 You can select all portfolio by clicking on the Portfolio tick box on the left of the Portfolio name in the header or select portfolio one by one. Please not that it is not possible to rebalance a portfolio with zero asset under management. Click on Rebalance Selected button. You can select Minimum Portfolio drift, Minimum transaction size, exclude not compliant securities and not suitable securities. Once you filtered portoflio click on Generate trade blotter to produce a CSV file. This file can be adapted to your custodian / bank format. 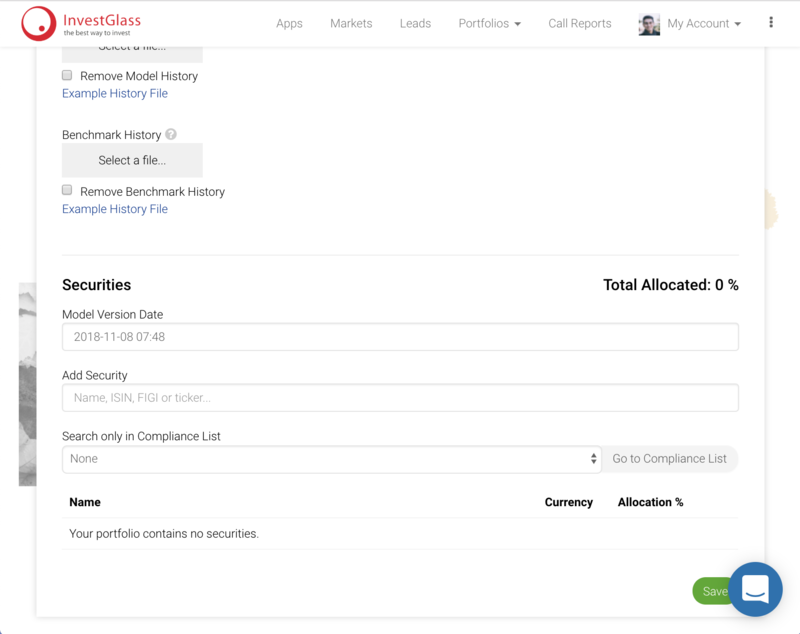 Please contact us at contact @investglass.com If you wish to rebalance one portfolio, mouse over the line and click on the three dots on the far right. Click on Export Trade Blotter.